The small black dog barked and wagged its tail. “Okay. 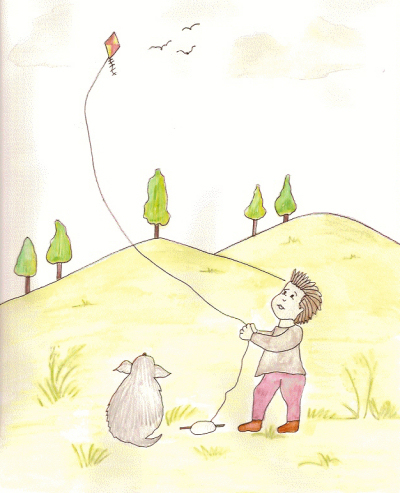 I'll go and get my kite.” Mike gathered everything he needed and they headed to the park. Mom sat on the bench under a spreading oak tree. Mike and Sport ran off. “This is a perfect place.” He ran with the kite in his hand, releasing the string. The kite soared into the sky. When it was high enough, Mike stopped running. “There we go. Now we have to watch it fly around.” Sport wagged his tail. A few birds flew around the kite, curious about the strange object, but then flew off without disturbing it. After a while Mike started fidgeting. “I'm bored. It isn't fun to fly a kite all by yourself. Maybe Mom will come and help me.” Mike turned to see his mom. “Mom! Mom!” He shouted but she didn't hear. “Do you think so, Mom?” Mike giggled and ran after the kite. He came back with it in his hand. Mom took the string and let it go. The kite rose higher and higher, reaching for the clouds.